Hiro Nakamura has the abilities of time travel, time manipulation, and teleportation. 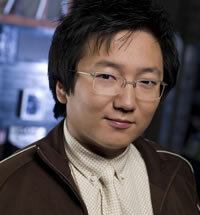 Hiro Nakamura was originally a cubicle worker alongside Ando Masahashi, who was to later become his faithful sidekick. Hiro first manifested his super powers by momentarily stopping the clock at in his cubicle at Yamagato Industries, where he was a programmer. Hiro Namamura is the son of Kaito Nakamura and the brother of Kimiko Nakamura. Hiro's best friend is Ando Masahashi. After teleporting after stabbing Sylar in the episode "How To Stop An Exploding Man", Hiro arrives near Kyoto, Japan in the year 1961. There he meets the real Takezo Kensei, who turns out to be not only British, but not the hero that the legends say he was.